The Departure of S.W. 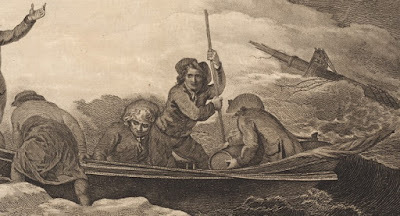 Prentice and Five Others from their Shipwrecked Companions, 1781, Robert Pollard, 1784, Toronto Public Library. Ensign Prentice (sometimes spelled "Prenties") was an officer in the 84th Regiment of Foot, the Royal Highland Emigrants. In November of 1780, Prentice was ordered to carry dispatches from General Haldimand from Quebec to Sir Henry Clinton in New York. Departing aboard the brigantine St. Lawrence, the voyage was expected to be a short one. Unfortunately, St. Lawrence was not up to the job. Taking on water as she sailed in "intensely cold" weather, the crew early on despaired to the point of mutiny. A snowy gale eventually overwhelmed captain and crew. Early on the morning of December 5, 1781, the St. Lawrence was pooped and abandoned. 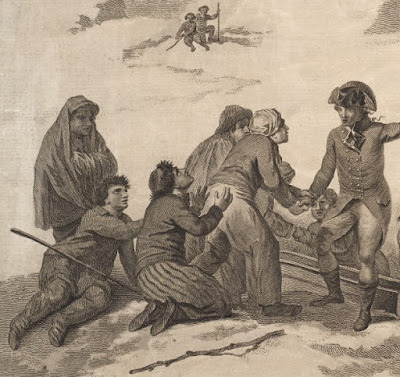 Thus began a story of survival on the frozen Canadian shore. Prentice's recollections were published the next year as "Narrative of a Shipwreck on the Island of Cape Breton, in a Voyage from Quebec, 1780." While you can read the Narrative in its full at Archive.org, be warned that a critic in the London Review for August, 1782 deemed it "often vulgar, sometimes silly, and always insipid." 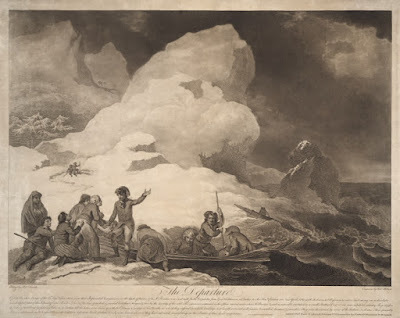 Regardless of Prentice's failures with prose, Robert Pollard found enough inspiration in the story to compose this print of Ensign Prentice's departure to seek help for the starving and freezing tars. On January 4th, Prentice and a few others piled into the surviving boat to try for safety and rescue for their companions. They would not reach it for months. In the meantime, Prentice would wander the seas, contemplate cannibalism, and make contact with native peoples. Gathered about him at the beginning of his harrowing journey, sailors clasp their hands and look with pleading faces to the brave young army officer, while others manage the boat against the harsh sea. Ashore are a number of unfortunate jacks. Those closest to us are rather pitiful looking, but their clothing doesn't much show it. All wear trousers and jackets. One, to the left and with his stick across his lap, appears to be wearing a smock with a short collar. In the middle kneels a tar with a Canadian cap and striped trousers. The others wear short caps, possibly knit of linen working caps. Of the seven or so sailors visible in this scene three carry walking sticks, and a four has a stick nearby which appears to be a makeshift walking stick. The numerous instances of sailors ashore depicted with sticks was a great surprise to me when I got a few months into this blog. This image, perhaps more than any other, shows just how important this accessory was to Jack Tar. Starving, freezing, and despairing to the point of death, they still cling to their sticks. One appears to have even taken the time and energy to fashion his own out of the barren landscape. Loading and manning the boat are a few more sailors. At the tiller is a rather well dressed man, who might well be the hapless captain of the St. Lawrence. The other tree are clearly sailors. Furthest forward is a man in petticoat trousers that run to the top of the thigh, showing off his dark stockings. His jacket is clearly tucked into the petticoat trousers. He wears a round hat with a narrow brim, possibly bound in matching tape. The two other sailors wear single breasted jackets and white neckcloths. The one standing wears a pair of trousers with a broad fall, and his jacket ends right at the waist. His hat might be a cocked hat, but it is difficult to tell. His mate wears a round hat with a narrow brim, falling back on his head.